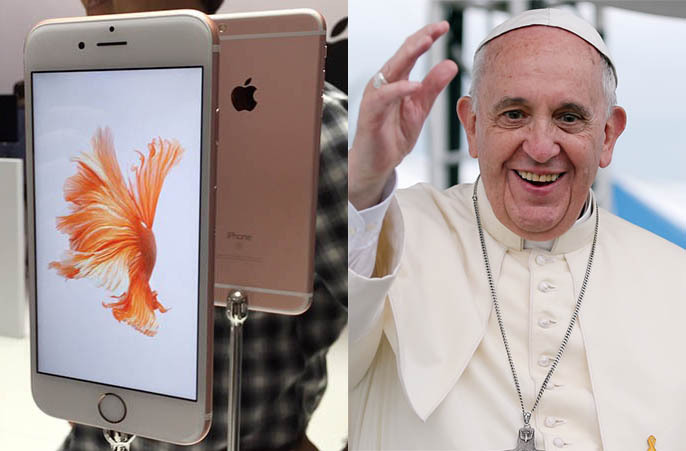 While many customers around the world anticipate receiving their brand new iPhone 6s or iPhone 6s Plus when the smartphones launch on September 25, pre-order deliveries in areas of New York City and Philadelphia could be delayed as Pope Francis prepares to visit both of those cities next week. UPS, a courier service that frequently delivers Apple pre-orders, has posted a temporary service notice on its website that states no pickups and deliveries will be available in the following ZIP code areas of NYC and Philadelphia this Thursday-Friday and Friday-Saturday respectively due to security measures. The affected areas in New York City are all in Manhattan, including parts of Chelsea, Civic Center, East Harlem, Midtown, Tribeca and the Upper East Side and Upper West Side. Pope Francis will be making appearances in those areas at St. Patrick's Cathedral, United Nations headquarters, 9/11 Museum, Central Park, Madison Square Garden and elsewhere next Thursday and Friday. The affected areas in Philadelphia include parts of Bella Vista, Callowhill, Center City, Devil's Pocket, Fairmount, Grays Ferry, Logan Square, Mantua, Northern Liberties, Passyunk Square, Pennsport, Point Breeze, Poplar, Powelton Village, Rittenhouse Square, Society Hill, Southwark, Spring Garden, Spruce Hill, University City, Washington Square West, West Philadelphia and West Powelton. UPS typically offers the option of personal pickup at a holding facility, so there remains a possibility that some New York City and Philadelphia residents will be able to receive their iPhone 6s and iPhone 6s Plus deliveries on launch day. For others, however, it may mean waiting until Monday to get that shiny new iPhone. FedEx and USPS have since confirmed they will be following similar security procedures. Update: A UPS spokesperson told MacRumors that it has been in communication with customers ahead of the Pope's visit. UPS has been in communication with customers ahead of time about the impacts of the Pope’s visit through handouts, placards on drop boxes and phone, personal and email contact. This is very typical for large events like this where there is a lot of security requirements and limitations. UPS has worked through these types of events on multiple occasions. For those ZIP codes that are affected, other alternatives include routing deliveries through UPS My Choice to another location. Note: Due to the nature of the discussion regarding this topic, the discussion thread is located in our Politics, Religion, Social Issues forum. All forum members and site visitors are welcome to read and follow the thread, but posting is limited to forum members with at least 100 posts. This is the ultimate troll! That's why I renounced my Catholicism (Still Christian). The Catholics worship this man as if he is God himself... and that is a no no. No Catholics believe the pope is God. That would make them not Catholic, just like you! Samsung paid him to come to those cities around iPhone launch. :) Lol. This is due to security not due to worshipping him as if he's god. I guess those iPhone fans need a miracle.